Most people in America celebrate Easter with a church service, an easter egg hunt and dyeing eggs pastel colors. 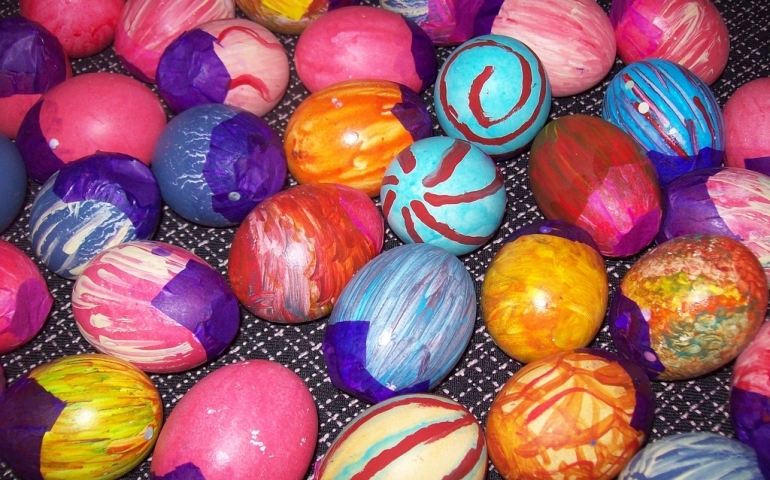 However, since the holiday’s name and all the secular traditions associated with Easter are products of its pagan origins, many countries around the world celebrate it in a unique way. There are many people who believe that Easter’s pagan origins center around one story, The Descent of Inanna, which was found in the Mesopotamian civilization that dates around 2000 BCE. To make a complicated myth simple, Inanna, who is a goddess from heaven, went to the underworld and was “hung naked on a stake,” which released her from the underworld (McDougall). This parallel between the Sumerian myth and Jesus’ resurrection is believed to have been recognized by monks during the time of Christianizing the Anglo-Saxons, along with the similarities of other myths (such as of the goddess of spring, Eostre), and thus eventually influenced the use of the name Easter for the celebration of the resurrection. Despite this, many countries today either do not celebrate the holiday or celebrate it in light of its pagan origins. According to Jessica Gusman’s “Top 5 Easter Traditions From Around The World” in The World Post, some European countries with Anglo-Saxon roots light “Easter Fires” to welcome spring and “chase the darkness of winter away.” Yet in Bulgaria, the tradition is to have egg fights, and it is customary to declare the person who survives the fight with an uncracked egg the “most successful member of the family in the coming year” (ytravel). Perhaps one of the most intriguing traditions of the holiday in Europe, however, is Sweden’s creation of a Halloween-like atmosphere for Easter. The only major difference is that Swedish children give art to the people they meet while going door-to-door to get candy. The Mexican tradition of making cascarones, or dyed eggs filled with confetti and glitter, is an exciting Easter pastime that I have had the privilege to participate in during high school. The process of making them is tedious, as it requires removing the yokes as well as decorating them. Once they are ready, each person takes an egg and attempts to chase down someone else and break it over their head, supposedly bringing that person good luck. Cascarones are well worth the mess and the time if you are looking for some fun. No matter the tradition, Easter is about the celebration of life. So, take the time to celebrate life with your family this weekend, and happy Easter! The picture above is used under Creative Commons License, which can be found here.